Once you understand how your household uses energy you can take some sensible steps to try and reduce that amount. This might be simple behavioural changes or accessing government finance to thermally upgrade your insulation. Whatever action you decide on you will have the support of a LEG officer for guidance. One DIY option is draught proofing. Below you can see two images of my front door. The one on the left shows a clear cold patch at the bottom of the door (despite having a draught excluder on it). The picture on the right is exactly the same image only this time I have drawn a curtain across. Without the camera I would have presumed the draught excluder was doing a good job! Welcome to a series of blogs on How to Green Up Your Home, a common sense and practical bit of guidance on how to help make your home the energy-efficient, affordable, healthy place that it should be. As an architect from Arisaig with over a decade of experience of putting this guidance into practice on all sorts of projects I’ve found that many folk want to do something about those draughts, or reduce their heating bills, or deal with that bit of damp…but don’t trust salesmen with obvious vested interests, or the government for that matter, and aren’t sure how to go about things. This series of blogs will cover those aspects mentioned above and in this one I’d like you to have a look at the house you’re living in. By understanding as much as possible about how your home is put together you’ll be in a much better position to know the most appropriate way to go about making it greener and the subsequent blogs will make more sense. So, in what sort of house do you live? It is pretty likely that there will be a range of responses: timber-framed or concrete block houses, terraces and bungalows; detached or terraced stone cottages; converted barns, byres and steadings; and perhaps even the odd station building or wooden hut. For simplicity let’s split these into ‘traditional’ buildings (i.e. those built before 1919) and ‘modern’ buildings (i.e. those built after 1919). ‘Traditional’ buildings are typified by those with solid stone walls, bedded in lime mortar, bearing straight onto the ground without any discernible foundations, and which have ground floors of timber joists raised off the ground or solid earth or concrete floors. First floor and roof structures are built from timber, and roofs are finished with slates or slates directly on sarking boards, tiles, or thatch. Stone walls tend to be lined internally with timber laths on ‘dooks’ (wooden plugs hammered into the walls), internal walls were usually brick, and the finish was invariably lime plaster with wallpaper or paint. Doors were of panelled wood construction and windows were generally wooden sash & case. Now, it’s important to remember that these were built in the days when materials were expensive and labour was cheap, so local materials (lower transport costs) were used and put together using local skills, knowledge (especially of climatic conditions) and cultural practices which were handed down over the generations. This is why a traditional building in Lochaber will look quite different from a traditional building in, say, East Lothian or Fife. And how do traditional buildings work? Well, unless fronting a road, many tended to face south(-ish) so that the sun would help to warm the main rooms. Windows were used to provide views, daylight and ventilation to rooms, and many internal doors had ‘deadlights’ – fixed panes of glass – above them to get light into internal spaces such as hallways. As well as being the heat source for most rooms, fireplaces and chimneys played a vital part in ventilating rooms too. Some dampness in walls is inevitable but was controlled by having land drains around the outside of the house – the space between stone walls and lath & plaster linings also helped to limit dampness getting into rooms. Raised timber floors always had a ventilated space below, which kept the timbers in good condition and limited the risk of dampness. There tends to be very little, if any, insulation in these buildings and there are little gaps everywhere in traditional buildings, so they are draughty (paradoxically this can help keep them dry). Front and back doors usually had porches to provide some shelter when going in and out of the house and reduce draughts. Eaves could be ‘clipped’ or might have an overhang, depending on how exposed the house was to strong winds but gutters, downpipes and soil pipes were always of cast iron as they are solid, durable and can be easily repaired. Being built of predominantly ‘natural’ materials such houses tend to flex in response to temperature and moisture. They are also quite straightforward to maintain and repair. ‘Modern’ houses tend to include those built of block or brickwork, timber frame or other mass-produced materials. Its advent was the end of the Great War (and the effects of World War Two) when many traditional building skills were lost with those who had perished, and a great rebuilding effort was required. The ensuing mass production of cheap building components requiring low skill input led to the building industry we see today. This doesn’t, however, mean that the resulting buildings were of poor quality and there are some very good examples of post-war housing throughout Lochaber that will last for decades to come if looked after. Starting at the bottom again, such houses are typified by solid concrete foundations with masonry footings bedded in cement and capped with an impermeable barrier (a DPC, or damp proof course). Concrete floors tend to be laid over a plastic membrane to prevent moisture getting through; timber joist floors tend to be fitted above a ventilated space to keep them dry. External walls usually comprise an outer layer, or ‘leaf’, of brick or blockwork (maybe painted or rendered/harled with cement) and an inner leaf of brick or blockwork with gypsum plaster finish. Blocks and bricks are invariably bedded and pointed with cement. The two masonry leafs are separated by a ventilated cavity (hence the term ‘cavity wall’) that helps to prevent dampness from the outer leaf getting to the inner leaf. (Confusingly, many builders refer to this as ‘traditional’ construction, when it’s nothing of the sort.) In timber-framed houses, the timber frame, which is insulated nowadays, replaces the inner leaf and is usually lined internally with plasterboard. It is also usually the load-bearing (i.e. structural) bit of the wall. Internal partitions may be plastered brick or block, or timber frame with plasterboard. First floors and roof structures are usually of timber with roof finishes of slate or concrete tile over a plastic membrane. There might be insulation in the floor, walls or roof, but its performance depends as much as on how well it was fitted as how much there is: there’s no point in having a foot of insulation in one bit of your loft and none anywhere else. Other than the timber framing, these materials tend to be very hard, inflexible and not that straightforward to repair, which you may already have found on your own house. Modern houses also tend to rely heavily on plastic membranes to prevent moisture and water movement, rather than good design and understanding. The construction of houses built of such materials coincides with the rise in car ownership, which is why it’s common to find similar house designs orientated around road layouts rather than the more important aspects of wind direction, solar gains, views, surface water run-off, privacy etc. So, whether you’re in a traditional building or a modern building, go outside and give your house a quick look over – how clear are your airbricks? Where do you think those draughts are coming from? Why is one part of your house so much colder than the other? You might be able to take an educated guess at the answers to these questions now and we’ll explore look at them in more detail in the next article on Getting the basics right – dry boots, a warm coat, a good hat. Bye for now. Part 2: Getting the basics right – dry boots, a warm coat and a good hat. In this blog we’ll look at three things worth getting right in any house: keeping it dry, reducing heat loss and minimising draughts. Although they might just seem like useful property maintenance tips each will help to reduce waste, reduce carbon emissions and reduce the toxicity of your home, helping to make it greener in the long run. As always, let’s start at the bottom and work our way up. Houses get wet – especially in Lochaber. The trick, whether you’re in a new house or an old one, is to make sure that they dry out once it stops raining and there are a couple of things you can do to help this process. In wet weather water will accumulate around your house. If it can’t drain away your house will slowly become damp through absorption by the building materials and by evaporation of the water into rooms, which could cause cosmetic and structural damage as well as major health problems (which we’ll cover in a later issue). So how do we stop this? Well, the very first thing to do is find out where the water is coming from and then help it drain away quickly. If the nearby ground slopes towards your house you might have a lot of water to deal with when it rains hard, so consider digging a ditch or installing a land drain between the slope and house that can take away a good proportion of surface water. Be careful and considerate about where this water drains to! Having tarmac, concrete or paving right up to the edge of your house is also a really bad idea as it creates an impervious layer that stops water draining away quickly. This situation can be improved by clearing a 12” wide strip, at least 12” deep, around the outside of your house and filling it with clean river gravel. If your ground floor is built from timber joists then make sure that all of the airbricks around the edge of your house are well above ground level, and are completely clear of weeds and cobwebs. New houses have a tough, plastic damp proof course (or DPC) built into the outside walls and, as long as the ground level is at least 6” (15cm) below the DPC, this should help stop moisture from the ground being absorbed by the building materials. Injection DPCs, timber treatments and other so-called ‘specialist’ damp treatments for houses never, ever tackle the cause of a damp problem – they tend to simply move dampness elsewhere and may fill your house full of chemicals. If you understand the problem then you can save yourself the hassle and cost of such temporary fixes. draughts are not the same as ventilation! The references at the end offer practical guidance on where draughts will come from and how to tackle them. Once you’ve tackled this it’s time to do as much insulating as is practical. If you have a loft then this is a good opportunity to have a clear out and see how much insulation is up there. It should be very neatly laid out and at least a consistent 14” (35cm) deep across the whole loft. Energy companies are legally obliged to fit insulation, free of charge, in some of their customers’ homes, though this is coming to an end so do call up to see if you’re eligible. I’d advise against installing cavity wall insulation: as noted in the previous issue, the cavity exists for a reason and filling it up might lead to problems in the future, no matter what the salesmen say. If you’re thinking about insulating your outside walls then speak to an architect who knows what they’re doing as it takes skill and understanding for it to be effective. Windows and doors, which can make a massive difference to heat loss and draughts, will be covered in a future issue. Your roof is your first line of defence against our precipitous climate and it’s worth remembering that every missing tile or slate on your roof is going to create a separate leak, which may eventually cause damp in your walls or ceilings if unchecked. Next, think about the condition of your overhangs (the eaves) and verges (the bit of roof that sticks out past your gable). These often have ventilation slots that allow fresh air into lofts or between rafters, which, in turn, keeps them dry. Make sure these are free of cobwebs or insects’ or birds’ nests. If you can see discolouration or water staining on the soffits of the overhangs or verges this is a sure sign that you’ve a leaking roof or inadequate ventilation that needs checking and fixing ASAP. Cracks in gutters and downpipes, or missing sections, will cause staining down the outside of your wall and create damp inside; inadequate supports for gutters or pipes will cause leaks at joints; gutters and downpipes that are too small for the job will overflow and cause damp problems. Although cheap and readily available, plastic gutters and downpipes are weak and have questionable environmental impacts. If you have cast iron it’s worth repairing them. If not then aluminium or galvanised steel are more benign and durable alternatives. You’ll appreciate that brevity of this article means the advice offered above is fairly general but, together with the references, it should help you understand the basics of how to keep your house warm and dry. In the next blog we’ll look at indoor air quality, moisture, ventilation and health effects of some common building materials. Although having a dry, warm house is important we spend, on average, 90% of our time indoors so it makes sense that these places also help keep us healthy. Bye for now. ‘Energy Savings Trust’ have practical information on draught-proofing and insulation. 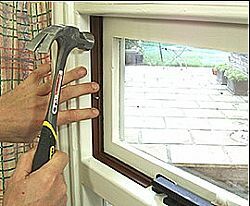 www.maintainyourbuilding.org.uk has guidance for general maintenance of your property, whatever its age or style.